Today is Labor Day. And in celebration of this holiday marking the end of summer - and one which used to mark the beginning of the new school year - conservative bloggers are taking the occasion to celebrate a new twist: Clint Eastwood's very funny monologue at the Republican Convention last week. No one knew what Eastwood was going to say: one of the perks of being an icon is that you can get away with not revealing much. Well, his act was something! According to the Right, it is entering the annals of the 2012 campaign along with "you didn't build that" and "hopeychangey"; there are lots of others. The Left dismissed Eastwood as a crazy old man but that's the best they could do. Given that part of his schtick was exactly that - i.e., playing a man talking to a chair- the complaint was lame. At any rate, Mr. Eastwood requested this empty chair to be on stage with him, and everyone figured he'd be sitting in it for his five-minute speech. 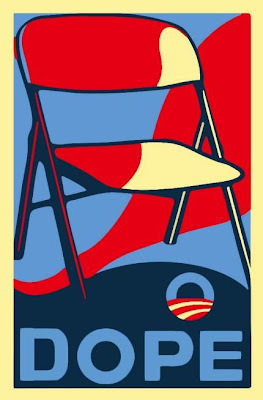 Instead (don't forget this fellow was a method actor before many of us were born) the chair became the place in which sat an imaginary Barack Obama. And Eastwod proceeded to have a dialogue with the airy BHO for ten minutes, not his allotted five...rank hath its privileges after all. So now the call has gone out to the conservative blogosphere: build your own chair. Put it on your lawn, or put it on your blog, but make Labor Day "Empty Chair Monday". UPDATE:...a design which he adapted for me from one sent to Michelle Malkin by a reader in Oregon. This acknowledgement would have been here when the post was first published (~ 2:00 a.m.) but Blooger ate it, not once but twice... make that three times. I gave up and went to bed - unable to either remove the unfinished post or to edit it. Perhaps we should ask for our money back? Thanks for the link to Eastwood's "empty chair" talk. I had heard about it, but this was my first opportunity to actually hear it. I thought the best part was at the beginning, where Eastwood said "You might be wondering why a movie tradesman is standing up here." Those words stuck with me throughout the speech. I was wondering if any cake would come with the icing, and it didn't. I'll give one major point. Eastwood slammed Obama for supporting the Afghanistan war, very correctly pointing out that the Russians had exactly the same experience in Afghanistan as we are having. The only problem is that it was George Bush and not Obama who made the decision to spend American treasure and the lives of our soldiers to reform an intractable Muslim society. The speech was filled with non-sequiteurs like that. In all honesty, unless the level of political debate and political comedy from the Republicans goes up, I'll be forced to spend time watching the Young Turks. I'm a big fan of Clint Eastwood but his schtick was rather painful to watch IMO. And I agree with the first poster that Afghanistan was Bush42's responsibility not Obama's. Obama doesn't deserve blame on this. In fact many of the suicidal policies our troops have to obey started under Bush and General Patreus. But BHO was going to bring ALL the soldiers home, remember? Instead the insane COIN rules of engagement mean that a soldier MUST let the enemy try to kill him first. No wonder the suicide rate in the military is so high. I recommend any of Diana West's essays on the subject, and on the Muslim Brotherhood. Ms. West is being marginalized by the MSM now. Outlets which used to publish her essays on those subjects spike them instead. On re-reading Antoine de Saint-Expury, she happened on a passage where he referred to Muslim tribesmen this way: "But I knew them well, my barbarians." What's Whiter Than the GOP? The Media! oops. This is starting to be a post-length rant. Might as well put it on the front page where it belongs. But I recommend going to Ms. West's home page and reading down. I put up a simple line drawing and a whole collection of empty chair links HERE. However, the Baron's chair poster is much better. Oh yes, How any government can send it's troops into a war zone with their hands tied behind their backs is something my mind struggles with. Clint was good in my humble opinion. No labels like "nonsense" re the post or other commenter' remarks. No insertion of subject matter that isn't contained in the post either. Finally,I don't give a fig about Obama's origins - Kenya or the rings of Saturn, it's all the same to me - I just want the man out of office. If an empty chair helps that effort, all the better. I was dismayed but not surprised by the media's effort to portray Clint as some old guy losing his marbles, talking to an empty chair etc. Little realising the symbolism involved - or perhaps hoping that the public would not realise - the chair behind the desk in the oval office is to all intents and purposes an empty chair. A no-one, an empty-headed nothing who came from nowhere and will return there very shortly, is occupying that office & sitting in that chair. And for all the good it does to speak the truth in America today, you might as well talk to an empty chair.